Nearly three months after a brutal dog attack that claimed the life of a Montreal woman, the city has passed its contentious pit bull ban. 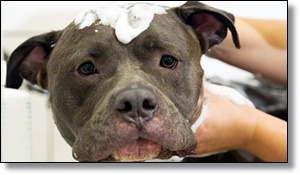 City council voted Tuesday in favour of changes to its animal control bylaw that include a ban on new ownership of pit bull and pit bull-type dogs. The final vote was 37-23 in favour of the ban. "My duty as mayor of Montreal is making sure I am working for all Montrealers," said Denis Coderre. "And I am there to make sure they feel safe and that they are safe." The bylaw vote was supposed to take place Monday, but was pushed to Tuesday due to a busy agenda. The city announced that the new rules, including the ban on new ownership of pit bull or pit bull-type dogs, will go into effect across all 19 Montreal boroughs starting Oct. 3. Members of Opposition Projet Montréal questioned whether the Coderre administration would be able to enforce the new rules. "This is going to create a bigger problem than a solution," said Coun. Sterling Downey.